Although tobacco was introduced to Europe in the sixteenth century, the way in which it was used differed greatly from modern habits. A fine tobacco powder known as snuff was inhaled from the back of the hand or the fingertips. Dried tobacco leaves were generally sold in tightly bound bundles, and, although commercially produced snuff was available, many snuffers preferred to make their own. Snuff rasps like this one were developed to be conveniently carried in a pocket so that a portion of snuff could be prepared at any time by grinding a bundle of drie tobacco leaves on the metal grater or rasp. Many snuff rasps incorporate a snuff-box to hold any excess produced, although this example does not. 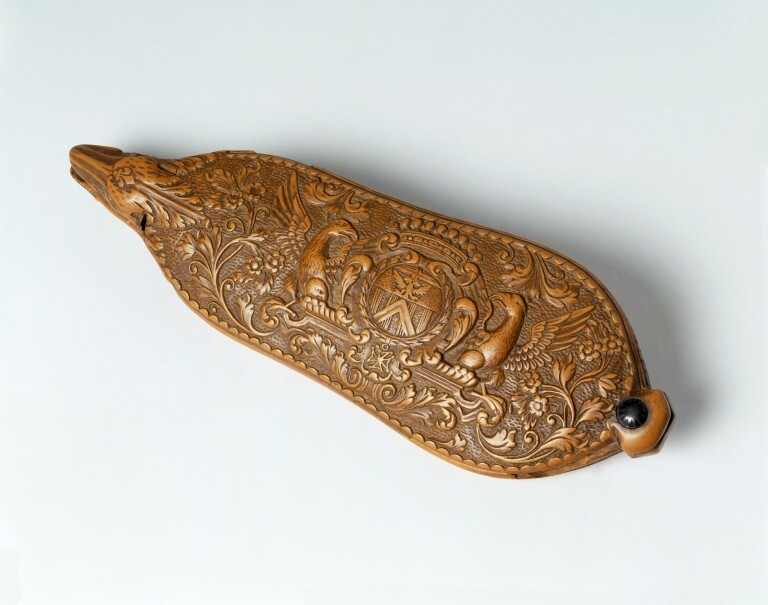 Snuff-taking was an expensive habit and could only be afforded by the well-to-do, with the result that snuff-related objects, like rasps and boxes are often made from precious materials like ivory, and are beautifully decorated with carving or inlay. This eighteenth- century French example is carved from boxwood and features a pivoting cover to the metal rasp. The snuff would collect under the rasp and then be tapped onto the hand through a channel here shaped like a duck's beak. Both the cover and the reverse of the object are carved, showing the coat of arms of a Knight of Malta supported by two eagles and surmounted by a count's coronet surrounded by sprigs of flowers, and the monogram DIV above a holly tree. Carved boxwood snuff rasp in two parts joined with a pin to allow the sections to swivel apart to reveal the metal grater. The cover shows the coat of arms of a Knight of Malta supported by two eagles and surmounted by a count's coronet surrounded by sprigs of flowers, and the reverse is carved with the monogram DIV above a holly tree. 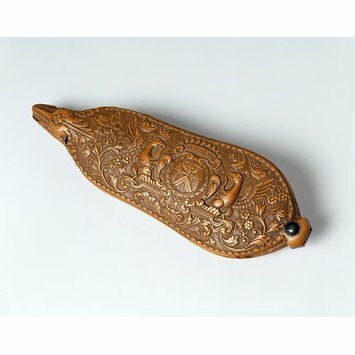 Carved on the back of the snuff rasp.